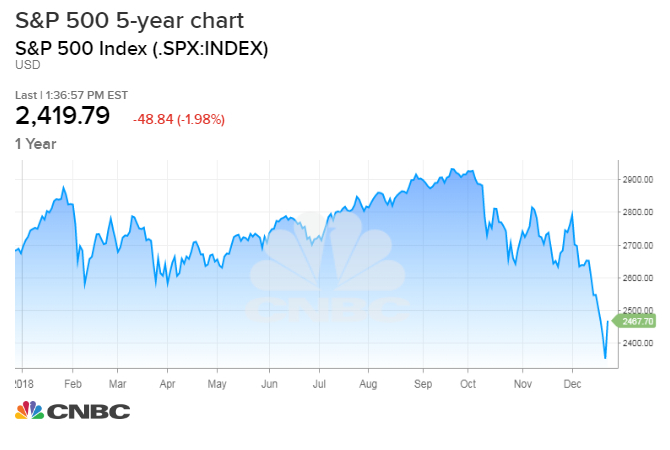 Investors looking for a quick end to the stock sell off could be disappointed and may have several more months of volatile trading to go before the market hits rock bottom, technical analysts say. That time frame coincides with the run up to major events that strategists say could be fundamental catalysts for the market. One is the March 1 deadline in the trade talks between the U.S. and China, and any resolution of trade issues could be a positive. The other is the Federal Reserve’s March 20 meeting where the Fed is expected to consider raising interest rates, but the market is betting the Fed instead could pause, a positive for stocks. The stock market’s wild swings this week, including the more than 1,000-point surge Wednesday in the Dow followed by Thursday’s sharp declines and bounce back, are signaling the market could be hunting for its lows. Technicians are debating whether the end is near but agree there could be other sharp swings higher and rallies before the market bottoms out. 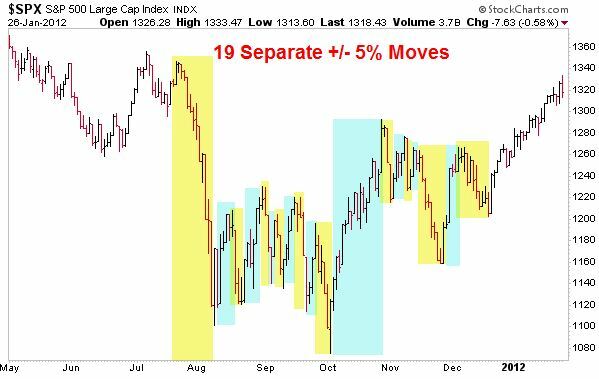 Wald said the absolute bottom could be weeks or even months away, and the market now appears to be making a high-intensity low. “Just how stretched we are to the downside, you can see with these big moves to the upside. It’s too late to become bearish, and it’s too early to become bullish,” he said. 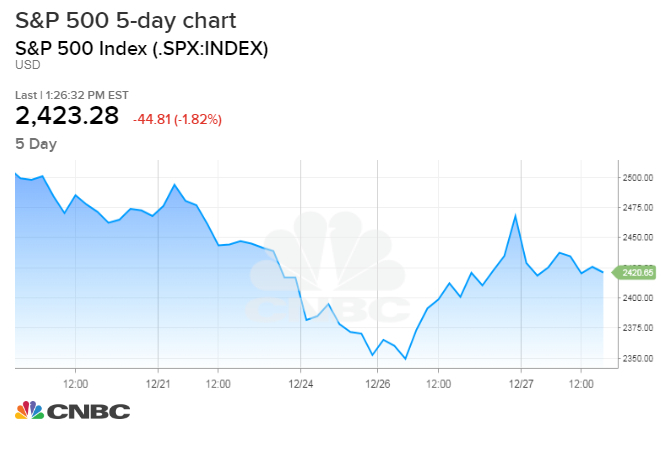 The S&P 500 ended Thursday up 0.9 percent at 2,488, after a sharp decline of nearly 2 percent earlier in the day, capping a very volatile week so far. The index ended the half-day Monday session down 2.7 percent at 2,351. Then it snapped back to 2,467 Wednesday, after being closed for the Christmas holiday. For the week, the S&P is up nearly 3 percent. The Dow also moved dramatically. On Thursday, the Dow traveled more than 870 points, from a sell off of more than 600 points to close at 23,138, up 1.2 percent on the day. The Dow is up 3 percent for the week so far. While there is no way to predict the duration of the market downturn, positive developments on trade or signals that the Fed could slow down its interest rate hikes could help stabilize the market. The earnings period is also about to get underway and that could also be full of surprises — both positive and negative since earnings growth has peaked this year at over 20 percent and forecasts from companies for next year could be even weaker than expected. If there is a positive development that changes the tone for stocks, Monday’s close could have been the low, Stovall said. Frank Cappelleri, executive director at Nomura’s Instinet, said the current sell off has been hard on the technical sign posts everyone has been watching. “Clearly yesterday’s low of 2,346 is on everyone’s radar screen now. Every other retracement level, or moving average, long term support zone, has not mattered at all on the way down. In the very least, we have a short-term reference point,” Cappelleri said. He said while pundits are busy pointing to market declines in the Great Recession of 2008 and the Great Depression in 1931, the better comparison could be the 20 percent decline from the intraday decline in 2011. In the 2011 selloff, there were seven 10 percent moves in both directions in the S&P and 19 moves of 5 percent, he said. Wald said he still believes the bull market is intact. “What I’ve learned over the years is nobody knows where the market is going … You can make money in the market not by knowing what the market is going to do but having a process. Technical analysis is a process,” he said. He said just 8 percent of the S&P 500 companies are above their 200-day moving average, the lowest amount since 2011, when there were just 7 percent above. “We still think we’re in this secular bull market that’s going be led by high growth companies in a low growth world. It’s stocks like Apple and Microsoft, you will get those losses back eventually. I’m much more worried about stocks with global and commodity exposure, like energy, industrials and materials,” he said. 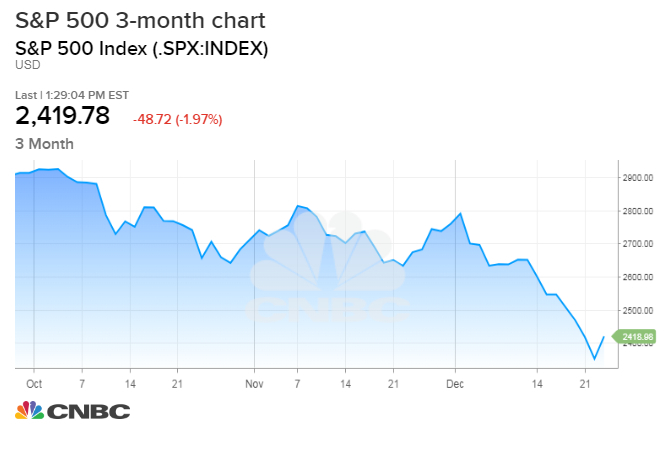 Bruce Bittles, chief investment strategist at Baird, said the pessimism from the market’s half-day Christmas Eve bloodbath, where the Dow lost more than 600 points, was the sign of a possible step toward a bottoming. “We do think the decline on December 24 caused pessimism to soar, which is one of the requirements we are looking for to identify the start of the bottoming process. We anticipated the VIX jumping to 35 and that was fulfilled on Monday but historically all serious declines have the VIX stretched much higher. As a result, additional data is necessary for confirmation that the lows could be in place but we remain skeptical,” Bittles said in a note.